I Made It! Holiday Market 12/2 & 12/3 – See you there! Hooray! A great, local and locovore craft & art Holiday show is coming up! We’re thrilled to be a part of the 5th annual I Made It! For The Holidays, and this year’s show is going to be the best yet. Join us and over 80 other artisans and crafty vendors offering our handmade works for sale. Handmade makes for special and fun holiday gifting! This year’s I Made It! 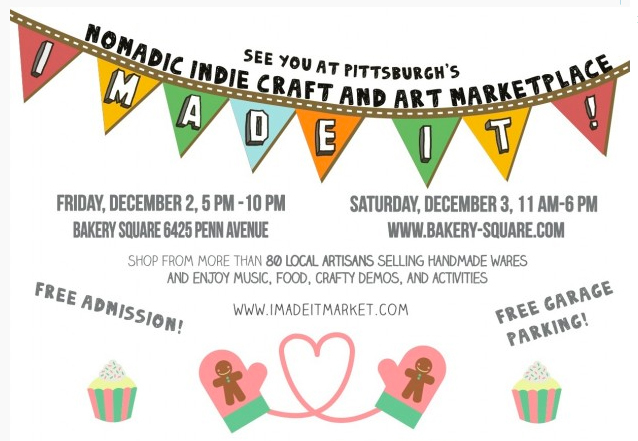 Market, Holiday edition takes place on Friday evening, December 2nd from 5 – 10 pm and Saturday, December 3rd from 11 am – 6 pm at Bakery Square on Penn Avenue. And it’s totally free to attend! Parking is free too! We will have tons of hand silkscreen printed art prints, alphabet prints, t-shirts, and rock posters and more on hand for gifts for friends, family, even you. That’s right! So come on over and say hi! The shopping festivities will include over 80 artisans, demonstrations, music and merriment as shoppers warm up from the cold, see friends and make new ones, and best of all, cross all of the names off of their holiday shopping lists. FREE to attend & FREE Garage & Lot Parking too! What: I Made It! For The Holidays, arts & crafts show featuring handmade works of awesome. I Made It! Market is a nomadic indie crafts marketplace. We provide opportunities for local artisans to bring their wares to market and we partner with non-profit, arts and community groups to raise awareness and funds for their causes. Bakery Square is home to Google, UPMC, Anthropologie, Free People, Urban Active Fitness, Coffee Tree Roasters, Learning Express Toys, Springhill Suites Marriott Hotel, Massage Heights, Boxwood, University of Pittsburgh, Veteran Administration and more. This entry was posted in Uncategorized and tagged art shows, artists, arts and crafts, bakery square, craft shows, crafters, DIY, free parking, google, handmade, holiday market, holiday show, holidays, i made it market, pennsylvania, pittsburgh, shows, strawberryluna by strawberryluna. Bookmark the permalink.